Do come for a walk to see the changes! It was great news that the Poors Allotment area was judged to be satisfactory by Natural England - its taken years of hard work to get to that point. The three ground nesting birds that have long been on the RSBP conservation Red list have now been up graded to amber status, they are Night Jar, Dartford Warbler and Woodlark ! Improved habitat is given as the main factor in helping their better outlook !! It makes it all worth while - we just need to keep working at it as it can all slip back so quickly. As mentioned recently the 2014/15 conservation season begins next month. It is proposed that the first HCS work party will be on Saturday 11th October and then Wednesday the 15th October and every Wednesday morning thereafter. We shall be in touch soon with more details and more dates pertaining to weekend work parties. Remember we meet at 10am and finish at around lunchtime. We meet at the barrier at the end of Bracknell Road on the Old Dean at 9.45am. We hope to see many of you over the coming weeks as there is much work to be done! For more information and to confirm your attendance please phone David Norminton on 07966 287113. The content of this email (slightly modified ) sent to some local schools in Camberley Surrey also applies to any school no matter where and equally to the general public. Although there is no need to panic, following the confirmation that one of our HCS Officers has contracted Lyme disease from a tick bite, we have never the less been advised to make local schools aware of the time of year the ticks are most active and some simple precautions to take to reduce the risk of being bitten. Also the importance of correctly removing ticks and getting medical help if feeling unwell following having been bitten. The Officer in question, despite the precautions taken, was bitten by a tick whilst working on the Broadmoor to Bagshot Woods and Heath SSSI/SPA in the vicinity of Pine Ridge School, Esher Road. Although ticks are to be found throughout the year they are most active between May and October. This year because of the mild winter the number of ticks has increased considerably, not only in the open countryside and woods but also in parks and private gardens, especially where the grass has been allowed to grow long. Lyme disease, also known as Lyme borreliosis, is an infectious disease caused by the bacterium Borrelia burgdorferi belonging to the bacterial genus"Borrelia" members of a larger family Spirocheates. In nearly all cases Lime Disease is transmitted to humans by the bite of a tick. It must be remembered not all ticks carry the disease but if anyone feels unwell or develops a rash after being bitten, prompt medical help must be sought. If left untreated there is always a risk that it could develop into something more serious. It is important the correct method of removing ticks from both pets and humans is followed. A tick removing device which should be used can be purchased from vets and pet store. If this device is not at hand then thin strong cotton can be used by placing a single loop around the mouth parts of the tick as close to the skin as possible, this will, with care, enable the tick to be removed in one piece. It is also important not to touch or place pressure on the body of the tick as this will result in the infected contents of the ticks digestive system being regurgitated into the wound. Never use blunt end tweezers such as those designed for eyebrows for this very reason. Under the Wildlife and Countryside Act covering the Ground Nesting Birds (SSST/SPA's) at this time of year (coinciding when ticks and Adders are most active), there is a requirement for dogs to be kept under strict control and for both humans and dogs not to walk into the heather, bracken and other flora, however, this is not always observed by members of the public. To sum up, I would suggest at this time when the schools are breaking up for half term, that Parents and older children are made aware of a the salient points above and advised to dress sensibly when walking the countryside. Emphasise to keep strictly to the paths and not to be tempted to wander or let their pet wander onto the flora. Also remind them of the importance of examining their children, dogs and themselves for ticks (they can be very small) when they return from their visit to the countryside no matter where that may be. As always first and foremost I give a big thank you for the support I have received from both the members of the HCS Executive and our HCS SPA Protection Group Partnership Committees and members. Especially at a time when there has been such a high demand on both a reduced manpower and financial resources especially of late with the strong winds and floods. I will start my report with the conservation work our volunteers have carried out during the season that has just closed. What a season it has been, achieving what was thought impossible. Our Conservation Manager David Norminton must be proud of the effort and results he and his team have achieved. Proving you do not need great numbers only a dedicated hardworking few to reach the desired results; well done! SWT in consultation with Natural England identified the very large area of extremely dense invasive Pine that urgently required clearing to allow the former heather bed to re-establish. HCS published its dates for it's own conservation program to work alongside SWT on this project, on the HCS Web; every Wednesday morning and one Saturday and one Sunday a month for the duration. SWT had their own programme. In fact HCS had volunteers working every Wednesday from the 2nd October 13 and most Saturdays, including the one before Christmas, and three or four Sundays. HCS also was out on Christmas Eve night to remove a fallen tree on Tarmac Hill that was blocking emergency access. Unfortunately the season came to an end with about five working sessions short of completion. The HCS clear up project started in October 2012 is still going strong. It has been calculated that well over 100,000 bagable items and a further substantial number of large items have been collected to date. It has come as a little bit of a surprise how many items relate to "historical" dumping. The collectors whom we must thank are encouraged to go on by the number of members of the public who stop to commend the work being carried out and say what a difference we have and are making towards keeping the area a better place to walk. I must take this opportunity to convey our appreciation to the couple of independent volunteers who have helped to keep the Kings Ride area clear for some considerable time. SWT and DIO for the major part they are playing in helping with disposal of collected items. Jim, Trevor, and Charles worked hard in creating our new and exciting Website. It has enabled me to now go forward in trying to get new funding. I was informed by the organisations I have contacted they look at applicants websites and have been told they refer to ours so it has been a help to say we now have a new one. A well deserved big thank you goes to all three of these outstanding men. Facebook plays a similar role and I think you will agree ours is one of the very best thanks to its creator Tracey whom deserves our sincere thanks as does Trevor who has taken it over and is putting his own stamp on it. Tracey's circumstances have changed and the pressure placed upon her resulted in the handover. Because of the various pressures we have found ourselves under during this past year hampered our hopes of conducting a meaningful drive to increase our number of members. This must be one of our top priorities for the coming year. Because we were not able to realise the required funding to achieve all our objectives during 2012 and the pressures confronting me in early 2013 and not having anyone to take on the task of raising funds has resulted us not being able to realise all our planned objectives. An application was made for funding from the Surrey Community Funding late 2013 and we are still awaiting their consideration. More details relating to this subject will be given at our forthcoming AGM. Over the past two years there has been a greater demand on our partners’ resources. This has resulted in a reduction in our coordinated enforcement patrols. Towards the end of 2013 Surrey Police relocated the two Police Officers that had been supporting us over the last four years. Although I have not named the two Officers they will know who they are when they read this report. Saying thank you to them seems insignificant to what support they have given. Unfortunately the flooding and other events have made it difficult to arrange a SPA partnership meeting because of resources are still being stretched. We need to re-establish our patrols soon as we are now seeing an increase in illegal motorcycling. Evidence suggests the offenders are not all local people and that some of the riders are mature males. During 2013 the Broadmoor to Bagshot Woods and Heath SPA was comparativly free from arson attack although there were a number of small camp fire size fires were lit but did not spread. This is thought to have been due to the various procedures now in place to combat wildfire. Over the last year HCS has had an increase presence on the area which hopefully also contributed. As HCS Chairman representing the Society on the Southern Counties and South East England Wildfire Partnerships I am currently involved in the joint Forestry Commission and University of Manchester's "Wildfire Threat Analysis Workshop"
The Defence estate, now DIO, has supported HCS since its concept and has hosted our HCS SPA Protection Group Partnership meeting since it was formed; this support has been very much appreciated over many years. The ground nesting birds are taking over and have evicted the SWT and HCS teams from the site! A big thank you goes to everyone who has been involved in making this season such a success. Between now and the start of the 2014/15 season in October why not join in our ongoing clean up campaign walking the paths and tracks picking up any rubbish you may come across. Give us a call on 07971 010048 if you are interested. We are also looking out for more observers. These are important people who when out enjoying themselves are prepared to use their mobiles and report anything that they see that they think is not as it should be. i.e. a tree that has fallen, a fire, illegal motorcycling, an animal in distress, dogs in the heather during the bird breeding time (fire and rescue dial 999, Police 101 and HCS 07971 010048) and also to report to SWT anything worrying about their grazing cows. Also keep an eye on our Web and Facebook to see what else may be happening during the Spring, Summer and Autumn months. Thank you again from the HCS Team. Dates for the 2014/15 season to be announced later in the year. 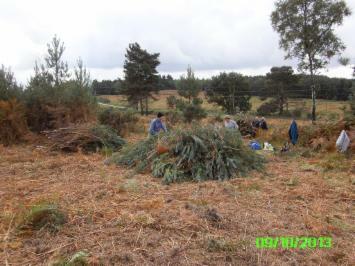 Work has started on clearing a former heather bed of invasive pine on the Poors Heathland site north of Camberley, Surrey. The area, to the north of the transmission tower (see map) will take most of the winter to complete. Further volunteers are urgently needed, if you are interested please contact David on 07966 287113. Pictured are some HCS volunteers, getting “stuck in” and making a real difference. The total number of churring males was 33, which compares with 33 in 2012, 37 in 2011, and the all time best of 39 in 2010. The number of territories has decreased in the Range Danger Area (RDA) from 20 in 2010 to 8/9 in 2013, however, the number of territories in the Saddleback Hill area this year was markedly higher than previously, while the number in the Deer Rock area and immediately south is rather lower. Woodcock were seen in 8 areas, Woodlarks in 2 areas, Dartford Warblers in 2 areas, Tawny Owls in 2 areas and a Little Owl was seen. 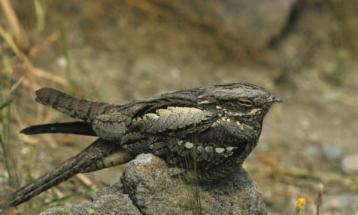 James Herd, who works for Surrey Wildlife Trust and runs the grazing on the MOD Camberley Heaths, has offered to organise the Nightjar survey next year. As we move into Autumn the land management work that we cannot do in the Spring and Summer because of ground nesting birds gets underway. We will be working every Wednesday morning starting 2nd October 2013, except Christmas Day and New Years Day. This year’s emphasis will be a large area of young pine to the north of the transmitting tower close to the underground reservoir that needs clearing. On all occasions we will meet at 10.00am and go on until lunchtime. Don’t forget we work in all weather and as such make sure you wear (or bring with you) waterproofs. Also bring a drink of your choice, any food and importantly wear suitable sturdy footwear (tools provided). 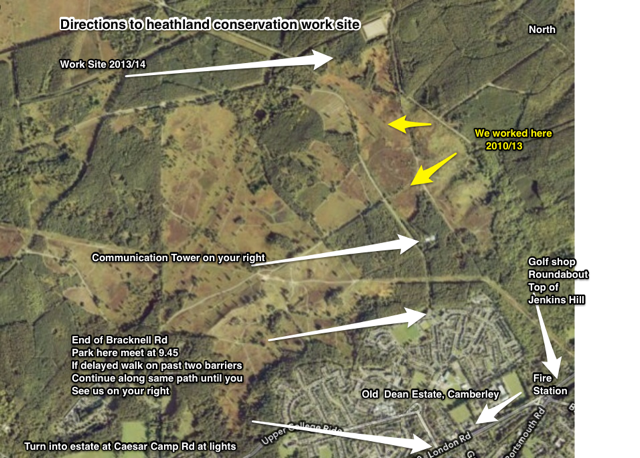 This land management work is vital to maintain the Heathland. Young [invasive] pine trees require cutting and saplings pulled. These are usually burned onsite. Whilst the work is serious it is also good fun and healthy. The Big Clear Up Continues! Just to let you know the “big clear up continues”. 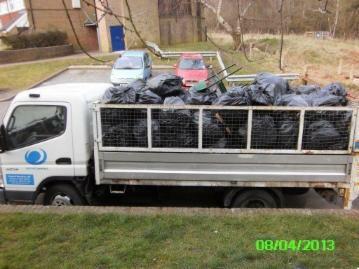 The number of black sacks of rubbish removed from the Heath and surrounding areas now approaches 400. This is on top of the large items that could not be bagged up (see photograph). We hope you have noticed the difference!? Let's work together and keep our Heathland a clean, tidy and respectable place for everyone to enjoy and safe for our local wildlife! 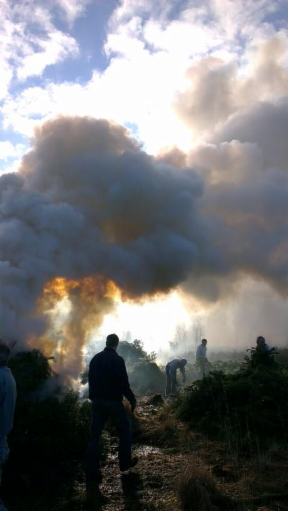 If you see an area of the Heath that needs cleansing please let us know and we will do our best to clear it up as soon as possible. The ten Belted Galloway cows have returned from their summer break within the RDA, to continue their good work on the Heath. Enjoy watching them but please note the following advice. • Do not feed them or try to touch them. • If you have a dog, walk around the cattle or choose another route if they are in the way. • Keep your dog on a lead. • If you feel threatened by the cattle don’t panic and run away, they are probably being inquisitive and might run to keep up with you. If you stop they will keep a safe distance from you. • In the unlikely event that the cattle do chase you, just let go of the lead and walk calmly away, keeping an eye on the cattle and your footing. The cows will be on the Heath until 7th October 2013.